NASA-JPL provides support for the GPS infrastructure through a network of permanent GPS stations called the Global GPS Network (GGN). The UNAVCO Facility supports the operation and maintenance of the permenent stations that make up the NASA-GGN. 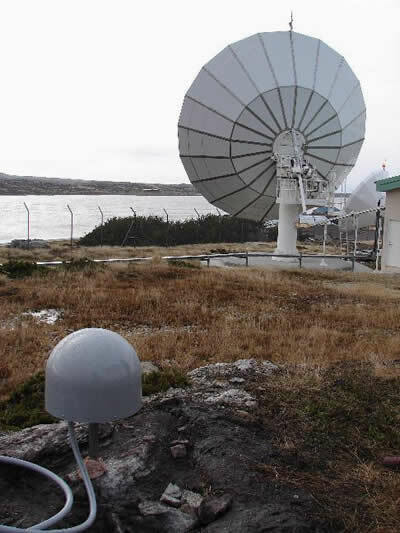 In order to increase the coverage of the GGN network, a new station (FALK) was added in Port Stanley, Falkland Islands, a United Kingdom territory. The islands are located about 500 km off the eastern tip of South America in the South Atlantic Ocean. The FALK site is on the Cable and Wireless South Atlantic Ltd. property in Port Stanley. The location offers excellent equipment security, environmentally controlled equipment housing, 24-7 internet connection, reliable power, and the location fills a previous gap in the GGN-GNSS network. The FALK station is operated by JPL/NASA and UNAVCO. The station equipment consists of: a Thales Chokering antenna with a SCIGN tall radome, a rackmount computer running Linux Fedora Core 4, a 220V uninteruptable power supply, and an Ashtech UZ-CGRS receiver. The internet connection bandwidth averages 10kB/s, allowing the site to operate in real-time mode. The antenna monument is a two inch diameter stainless steel pole set in bedrock with epoxy. A SCIGN mount is screwed onto the top of the pole. The 70 meter LMR600 antenna cable is protected by conduit and was placed in an existing cable tray outside the main building. The equipment is well grounded to the building ground. Figure 1 - View of GPS antenna with dome to the North.